1. Specially designed hydraulic circuit allows two speeds of mold traverse for accurate mold positioning. 2. Extruder in special structure for automatic upward-downward moving unit. 3. 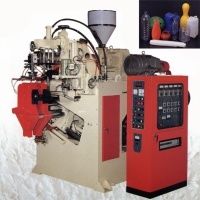 High plasticizing capacity extrusion screw is designed to handle material variations. The material is unable to oxidize, the quality of products is stable,the die head is easy and quick to clean the over materials.